When it comes to meetings, you have to be sure that you are prepared enough to know what you will be discussing to everyone involved. You need to prepare and itemize each topic in a systematic and orderly manner so that you can avoid missing out on any important topic. 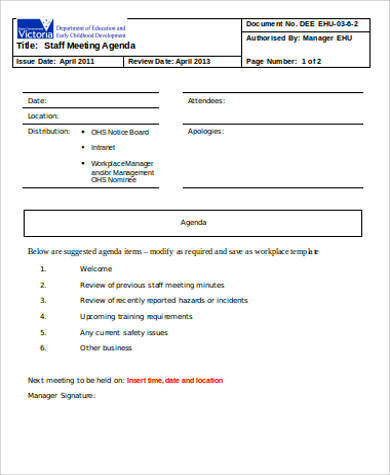 To help you out with keeping your meetings organized, you can take a look at our Meeting Agenda Samples. 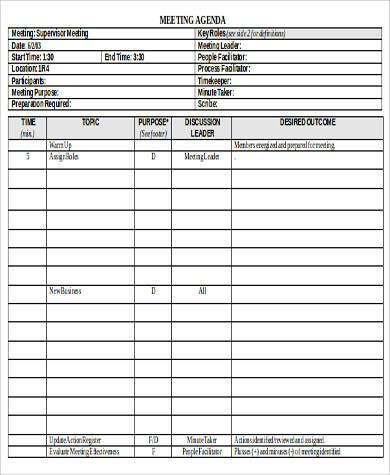 We have 9+ meeting agenda samples you can use for making your meetings systematic. There are various layouts and designs so you are sure to find one that will suit the needs of your meeting. In conducting meetings, you should make sure that everything is laid down clearly and it should also be planned ahead to make sure that no time is wasted. 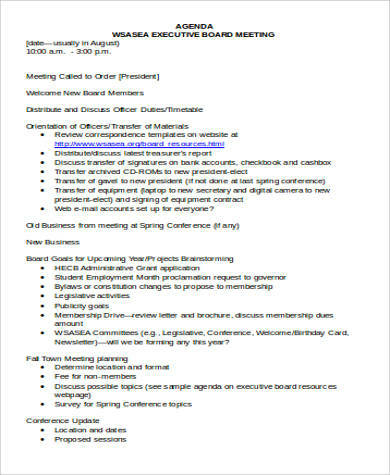 Here are some reasons that why there is a need to use meeting agendas. Meetings are a means of communication between members of an organization. 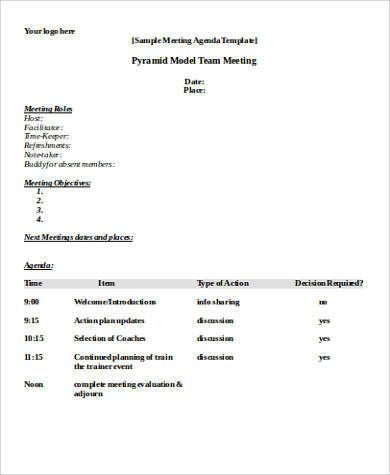 With the help of agendas, it can help everyone involved in the meeting who is responsible for the topics and how long each topic will be discussed. An agenda will serve as a checklist to ensure that no topic will be left behind. When agendas are distributed ahead to the members, it can help participants prepare for each topic and state their inputs for it. An agenda can help keep you focused on what needs to be discussed, save a lot of time, and reach the objective of the meeting. Making decisions will be easier as it can narrow down the topics to the most vital topics that is discussed. Though meetings will not be perfect and may not go as planned, agendas can help you take care of any setbacks during the meetings and take the appropriate action plan needed for the problems being faced by the organization. 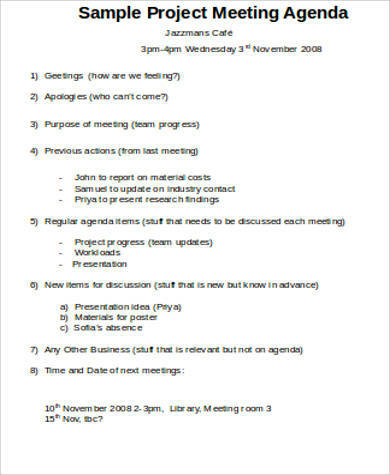 How to Create an Effective Meeting Agenda? The members involved in the meeting should help to contribute to what needs to be discussed for the day and ask for their inputs why there is a need to address such topics. Narrow down the topics to the most important ones. Choose the ones that give more impact to the team members. 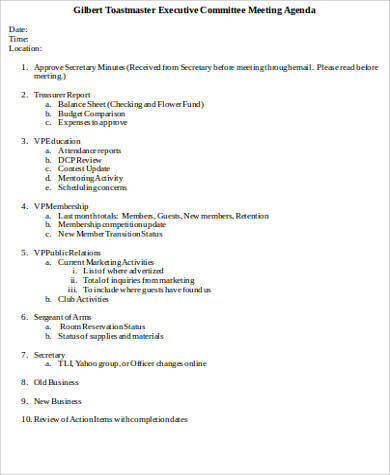 Allocate a time frame for each topic that will be discussed during the meeting. This aids to make the discussion more efficient and effective in a short period of time. 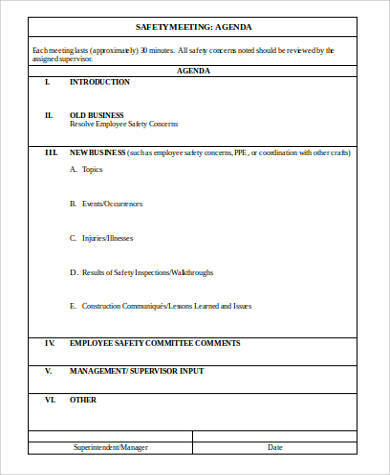 Mention what needs to be prepared during the meeting. This lets the members of the meeting come prepared for the meeting. State the name of the people or person assigned to each of the topic, if applicable. This makes it easier for the speakers to know when they would speak during the meeting. Send the agenda ahead of time to everyone involved. 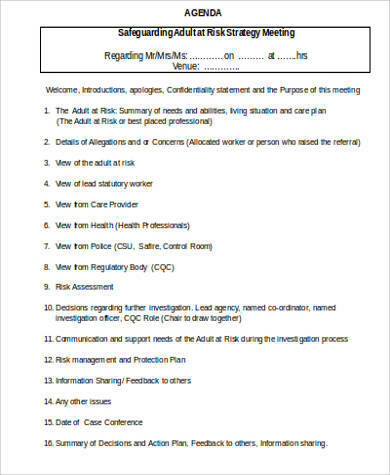 This lets everyone see what the topics to be discussed are and if there is a need to change any. The samples presented in this article can aid to make your meetings more systematic and more organized. You will be able to come up with outcomes that you can apply to solve the problems that arose in the organization. 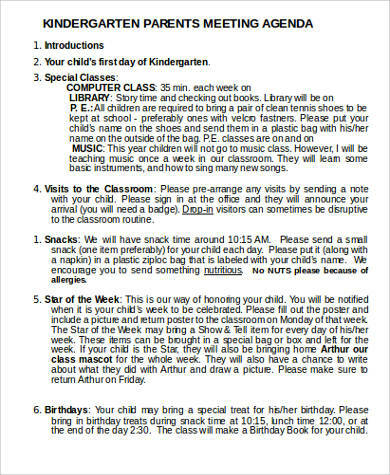 These templates are downloadable in Word Document format, which are very easy to edit and print. You can also look into our Staff Meeting Agenda Samples.